More than 1,200 of the nation’s big-city school leaders and educators exchanged their best strategies during the Council of the Great City Schools 59th Annual Fall Conference held last week in Long Beach. About 75 discussion sessions focused on topics such as equity and equality in education, Common Core Standards and teacher effectiveness, all tied to the conference theme of Sailing to Success in Urban Education. Student musicians and dancers provided numerous performances throughout the conference, while student artists supplied an exhibit of paintings depicting their favorite places in the city. Several educators from the Long Beach Unified School District presented at the conference, which was attended by educators from more than 60 school systems. Speakers at the conference included former NASA astronaut Jose M. Hernandez and CNN anchor Fareed Zakaria. Hernandez shared a compelling story of how one teacher positively impacted his life, helping him overcome tough odds as a child of migrant farm workers. CNN’s Zakaria warned against narrow comparisons with other nations based on test scores such as the PISA (Program for International Student Assessment) scores. Though the United States has not ranked highly on the tests, he said, the U.S. is “the most successful country in the history of the world.” He said that American schools should focus less on emulating schools in other countries, and focus more on the qualities of innovation and creativity that have made this nation successful. “The answer for American education, most importantly, is being more like ourselves,” Zakaria said. LBUSD Board of Education President Felton Williams is president-elect of the Council of the Great City Schools, which is the nation’s primary coalition of large, urban school districts. As one of the presenters at the conference, Williams joined LBUSD Superintendent Christopher J. Steinhauser and Head Counselor Kimberley Johnson of the Equity, Access/College and Career Readiness Office in explaining how the school district has significantly expanded student access to Advanced Placement college prep courses. 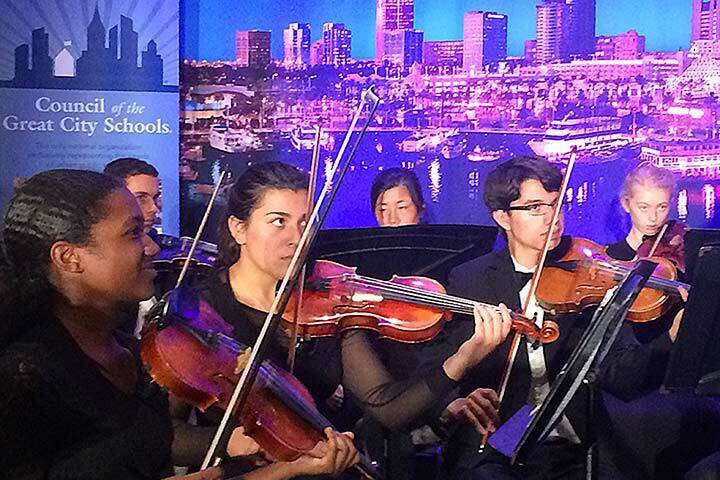 NATIONAL CONFERENCE – The Poly High School Chamber Orchestra, directed by Andy Osman, was one of several music and dance groups from local schools to perform during the Council of the Great City Schools 59th Annual Fall Conference in Long Beach. Poly's orchestra preceded speaker Fareed Zakaria of CNN.